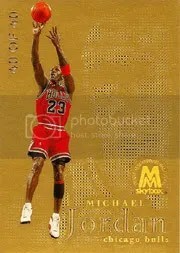 2012 arrives with much optimism and confidence in how I see the Michael Jordan Insert Market continuing to evolve. 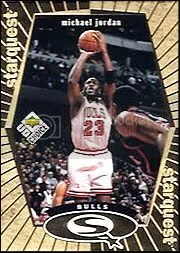 The high-end division is utterly dominated by natsturner, who every basketball card collector is familiar with by now. 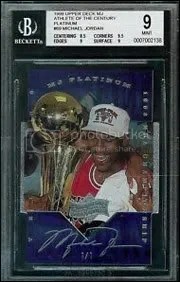 Nat wrapped up an unbelievable 2011 year, by picking up gem mint copies of two rarely seen cards – 1997 Ultra Stars Gold and 1997 Ultra 98 Greats Platinum Medallion /100 for a combined $14,000. 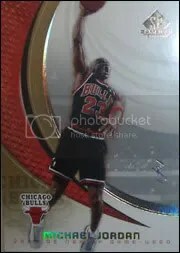 The Ultra Gold Stars was easily a Hupe Royalty Jordan Edition record high price and the sale of the Ultra 98 Greats Platinum Medallion was the first time I have ever seen one up for auction. 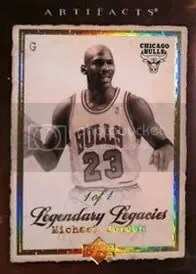 I saw eight various 1 of 1’s from 1999 Upper Deck Athlete of The Century, 1999 Ultimate Victory, 2005 UD SP Signature, 1999 Upper Deck Master Collection and 2007 UD Artifacts sold. 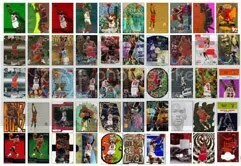 Many were graded, some were not. 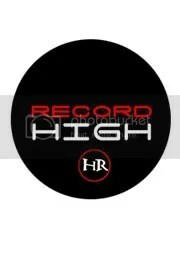 They sold anywhere from $1,000-$6,000. 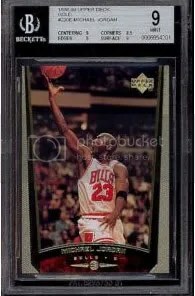 The first super high dollar sale of the new year comes from kobes_for_sale, who sold a 1997 EX-2001 Jamabalya BGS 9.5 for a Buy It Now price of $5,050. 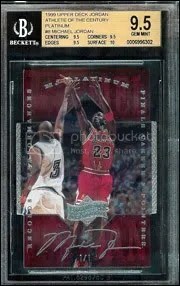 This is easily a Hupe Royalty record high for this particular graded card. 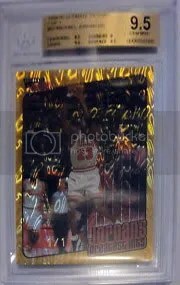 The previous high I had recorded for a BGS 9.5 copy was $3,483 by precious_metal_gems back in late August 2011. 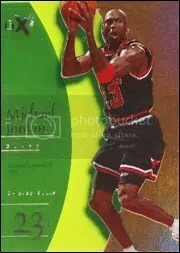 Michael Jordan collector, Jun, known as rare23air83 on ebay and various message board has continued to expand on his Jordan site and two of my favorite pages on there are his Top 5 link and his Info link. 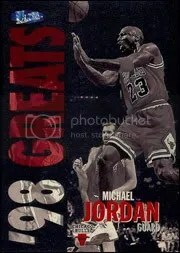 Definitely very informative and they are something I think collectors would enjoy reading. 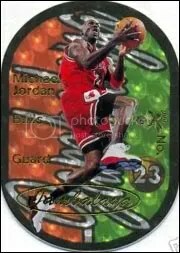 In 2012, I hope to finally see a Michael Jordan 1997 Metal Precious Metal Gems Green /10 show up on ebay and run via live auction. 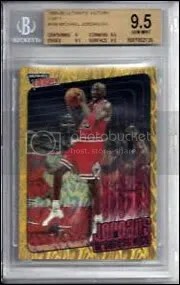 There was one that was available in 2011, but the seller removed it after he put up a $50,000 opening bid. 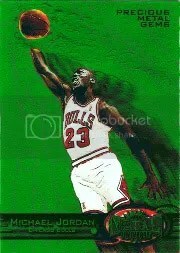 Other seldom seen cards I hope pop up on ebay in 2012 include these. 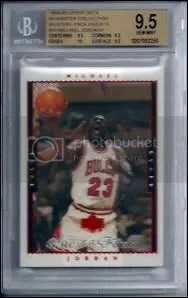 I know of one collector who owns the 1997 EX-2001 Essential Credentials Now /9, and I believe he is keeping it in his PC, so hopefully one of the other eight copies pop up. 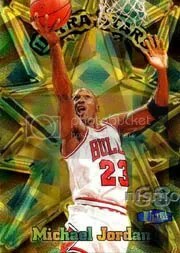 I wouldn’t be surprised to see that card valued at five digits. 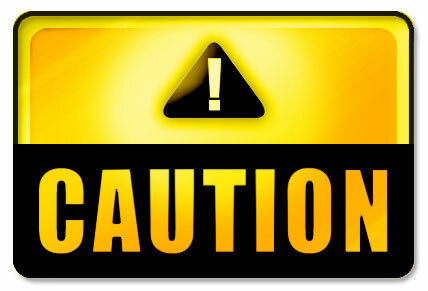 This entry was posted on Monday, January 2nd, 2012 at 8:11 pm	and posted in NEWS. You can follow any responses to this entry through the RSS 2.0 feed.